We can all look back and savor certain specific memories of significant events or turning points in our lives, and I would like to share with you a recent event that was added to my list of memorable memories. My novel, Soul Awakening, was originally published in October of 2011 by Book Locker. A few weeks ago, I was offered a four-book contract by an interesting, newer, up-and-coming publisher in Denver, Colorado, called 5 Prince Publishing. Their offer was too good to pass up and I gladly accepted it. 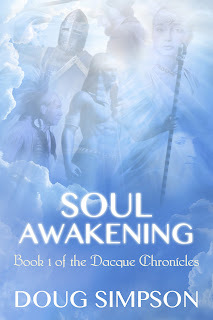 Soul Awakening, Book I of the Dacque Chronicles, will debut with 5 Prince Publishing on October 11, 2012 in eBook format and October 25 in print. Soul Rescue, Book II of the Dacque Chronicles, will debut on November 8, 2012 in eBook format and November 21 in print. Soul Mind, Book III of the Dacque Chronicles, is scheduled for a January 2013 release. Soul Awakening is a spiritual mystery/romance story involving the discovery of reincarnation and the past lifetimes by a group of individuals. It is a work of fiction, but was inspired by a series of actual events that were experienced by the author or other individuals known to the author. It involves the apparently accidental, though actually orchestrated by Divine Intervention, meeting of three total strangers, and their ultimate discovery that they shared previous lifetimes together. It includes episodes of spirit communication, messages from God, past-life regression sessions, Guardian Angels, past-life recall in the awake state, and Soul Attraction, which is the reincarnation of groups of souls together, in more than one lifetime, in order to deal with uncompleted Karmic connections from previous lifetimes together. The actual link to Soul Awakening, Book I of the Dacque Chronicles, has not yet been created but will soon appear on the 5 Prince Publishing website at http://www.5princebooks.com/buy.htm. Please stop by and see the other fine novels that they have published recently. Congratulations! Looks like an interesting publisher. Thank you Arlee Bird. I felt it was a progressive new publisher with a bright future. Thank you Susan Hawthorne. Believers in and the curious about reincarnation seem to find Soul Awakening quite interesting. Thank you for joining my blog. Hi Doug - Your new book sounds intriquing especially synchronistically with the offer you received from the new publisher in Denver, CO. I want to hear more. I'm happy the Dacque Chronicles project is going so well. Thank you Pat for your kind comments! !